16 February 2016 - "Hi Niilesh. My name is Amitabh Bachchan". That's the way I met this legend the first time. The way he introduced just swept me off my feet. Big B is the legend who needs no introduction. 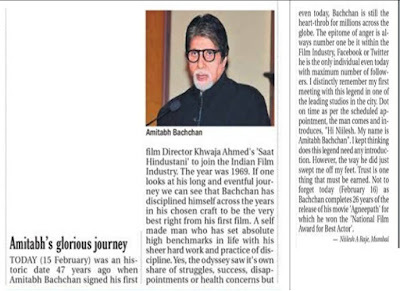 47 years ago a young man named Mr. Amitabh Bachchan walked into the office of Director Khwaja Ahmad Abbas to sign his first film "Saat Hindustani" to join the Indian Film Industry. The year was 1969. My piece "Amitabh's Glorious Journey" published in today's newspaper . . .